Provides fast relief of itchy, sticky eyes due to allergies while quickly reducing redness. Red, itchy, watery eyes; mucous build-up. Common cold, allergies to pollen, dust and animal dander. Zinc sulphate precipitates protein and helps clear mucus from the outer surface of the eye. Adults & Children 6 years and older: Place 1 or 2 drops in the affected eye(s) up to 4 times a day or as directed by a doctor. CAUTION: Do not use if you have glaucoma or serious eye diseases. If you are pregnant or breastfeeding, consult your doctor before use. Do not use product while wearing contact lenses. If you experience eye pain or changes in vision, or if redness or irritation persist or increase beyond 72 hours, discontinue use and consult a doctor. Overuse of this product may produce increased redness of the eye. If solution changes colour or becomes cloudy, do not use. VISINE® eye drops are produced under sterile conditions. To help maintain sterility, replace cap after use and do not touch dropper to other surfaces. Store at 15-30°C. Keep out of reach of children.If swallowed, contact a Poison Control Centre or doctor right away. I have suffered from seasonal allergies for decades. 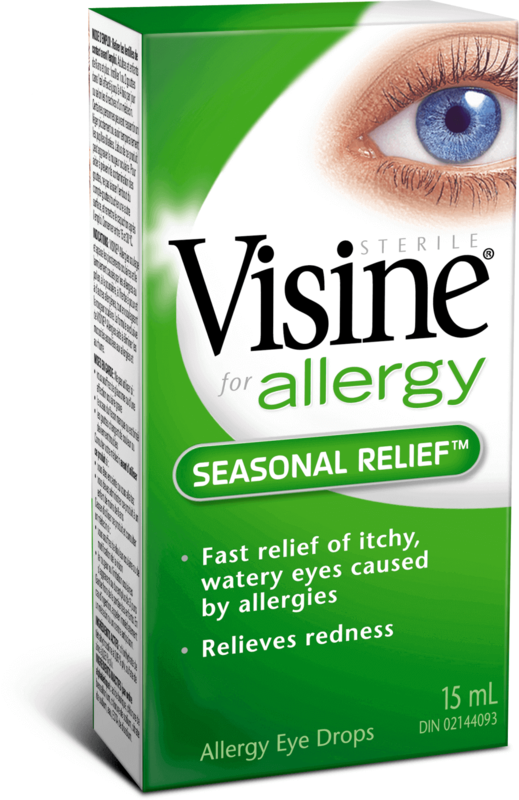 In addition to over the counter medication, I rely on Visine Allergy for complete eye relief. It washes irritants from my eyes and keeps me from rubbing and scratching with is very important. Relieves itchiness as well. A must have in my allergy fight! These eye drops are what I always reach for during seasonal allergy season. This amazing allergy Visine is the eye drops I use most in the spring and summer months. After using this Visine the puffiness and redness decreases and the itchiness stops. I recommend these eye drops for people with allergies that affect your eyes. I think these eye drops are amazing, thanks Visine!! I found this to be effective at helping me combat my spring allergies, especially when outdoors and experiencing itchy and red eyes due to pollen and mould. Visine allergy drops really help with the itchy eye symptoms of my spring allergies.